Talk trails to urban residents and you are likely preaching to the converted. Trails have long been recognized as one of the best-used and most cost effective recreational facilities in modern urban centres. They allow residents better access to open green spaces, promote healthy living and even affect economic development. Unfortunately, trails have not always held the same appeal for rural residents. One of the challenges for stimulating support for trails and green spaces in rural communities has been the sense that there is already an abundance of open space. But things are changing in Alberta. More than ever, rural residents are looking for ways to stay active and walking and cycling are becoming more popular pursuits. Rural residents want better access to natural areas such as lakes and wetlands and many would like to see linkages between rural communities and urban ones. Central Alberta is experiencing the benefits of this shift in attitude thanks to some innovative and forward-thinking rural municipalities who have taken the time to ask their residents what they want and followed through with a plan to make it happen. In 2005, Red Deer County commissioned an Open Spaces Master Plan that identified the need for trails as one of the most important recreational facilities to Red Deer County residents. A subsequent survey of residents in 2007 for the Recreational Facilities Master Plan reconfirmed the importance of trails when county residents listed trails as one of the top recreational facilities they would like Red Deer County to undertake. "Residents have said they want trails and we have been working on a plan to answer that request," says Jo-Ann Symington, Community Services Manager for Red Deer County. "The Open Spaces Management Plan identified three trails that were a top priority and we are currently working on plans to build a 3.6 km trails from Springbrook to Penhold, a 6.8 km trail between Spruce View and Dickson and a one km trail at the west end of Glennifer Lake to provide public access to the Red Deer River." The section of trail linking Springbrook and Penhold is planned to be part of the Trans Canada Trail and Red Deer County is hoping to apply for funding support from Alberta TrailNet and the Trans Canada Trail Foundation and to begin construction in 2009. "We see it as providing a valuable linkage between the communities of Springbrook and Penhold," says Symington. "We are in the process of surveying, completing the engineering for the project, and obtaining right of way. We plan to make it a showcase for the Trans Canada Trail in Alberta. There is a beautiful wetland area and there will be some opportunities for a unique design that has educational as well as recreational value." The Springbrook to Penhold section of the Trans Canada Trail and the other rural trails currently in the works at Red Deer County clearly demonstrate that attitudes are changing when it comes to rural trails in some parts of Alberta. The excitement about trails in Central Alberta is almost tangible and thanks to forward-thinking municipalities and hard-working trail advocates, we anticipate more exciting news about Trans Canada Trail development in Central Alberta over the coming months. A leisurely bike ride from Lacombe to Ponoka could soon be a possibility, according to the president of the Central Alberta Region Trails Society. Debbie Olsen said an increasing number of municipalities are helping develop a provincewide trail network that will give cyclists and hikers a road less travelled than Hwy. 2. "Wouldn't it be great to ride your bike from Red Deer to Springbrook, or Lacombe to Blackfalds? We've been working on it for a long time and I think we're finally getting somewhere. I think people want this," said Olsen. The next goal is to link cities and towns in Central Alberta with a system of rural trails through Red Deer, Lacombe and Ponoka counties. Olsen said plans are going well so far because so many municipalities are getting on board. The town of Ponoka recently applied for two grants that could see its trail system spread to Lacombe, Red Deer and even Edmonton. "We would anticipate starting the paperwork this year," said chief administrative officer Brad Watson. "I am anxious to have it. Red Deer and Lacombe are doing trail work and I would be interested in piggy-backing with one another, so that we do economies of scale and it makes the project more attractive for contractors." Watson said the town made applications for a $160,000 grant from Alberta Trail Net system, and an additional $160,000 from the Trans Canada Trail system. "What a wonderful asset and benefit to the town of Ponoka. People can go right up to Edmonton for the day and ride home, or to Red Deer and ride home. It's an excellent activity to walk, to bike ride and we even hope to have some of our areas wide enough that they can be used for equestrian or snowmobile use," Watson said. Phil Lodermeier, Lacombe's manager of operations, was also enthusiastic about extending Central Alberta's rural trail network. "I think we're evolving. We've traditionally been a very rural-oriented county that focused on hard services like sewage and power, and now we're starting to shift the focus to get more quality of life and amenities," he said. Lacombe County recently approved funding of $50,000 to construct a pedestrian bridge over the Blindman River, a project the trails society has been working on for years. After the bridge is complete, Lodermeier said the town will work on extending its rural trail network to meet trails from Ponoka and Red Deer counties. "We will be part of the trail running, hopefully from Penhold to Ponoka, with trails going right to the edge of our county," he said. Plans are also underway to build a trail between Penhold and Springbrook next spring. "We've been asking for it for a long time but they had to finish their open spaces master plan. All of these little separate things are happening as part of the bigger picture," said Olsen. The Central Alberta Regional Trail System got another boost after Lacombe County council agreed on Thursday to put money towards a bridge over the Blindman River. Most of the cost will come from a $200,000 grant from the Alberta Trail Net System and federal Trans Canada Trail system. Lacombe County will chip in up to $50,000 for decking and rails to build the bridge, said Phil Lodermeier, manager of operations with the county. Councillor Bill Knight expressed concern about money going to a recreational bridge when there are other bridges in the county that could use some work. He said farmers can't get some of their wider equipment, such as swathers and combines, over the bridges in his division. He said they'll have to take the header and put it on a trailer or drive it down a paved road where it is wide enough. Lacombe County has a Bridge Contingency Reserve that sat at more than $1 million at the end of December. "I'm not against recreation and a bridge like that, but some of these funds need to go to other projects, too. I guess my fear is if all this fund went to recreation, I'd have a problem with it," Knight said. Lodermeier said construction of the bridge would likely start in the winter of 2009-2010. At two-and-a-half metres wide, it would be large enough for pedestrian traffic and bikes. After the bridge is completed, the county will own and maintain it. The first phase of the Central Alberta Regional Trail System will go from Blindman River to the Town of Lacombe and will be completed over two or three years. Lodermeier said they would like to have park benches, bathroom facilities and garbage cans along the trail. "It's a relatively new concept. We're a rural county with typically rural services. So getting into the recreation aspect is kind of new for us, so we'll take our time, feel our way through it, to make sure we do it right," Lodermeier said. "It's good for the community. It's good for the quality of life and you see the trail systems in the urban centres being very well used and I expect ours will be as well." Reeve Terry Engen said the trail system has been on the agenda for a long time and it has been moving slowly, but it is time to cut to the chase. He said it will take a lot of community support to complete it. City Councillor Larry Pimm stops to read a plaque dedicated to Bob Johnstone, following a trail dedication ceremony held at Galbraith Park on Thursday. 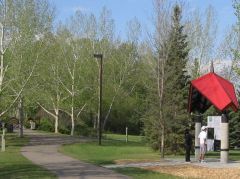 A 500-metre trail linking the 55th Street parkway to the south bank trail along Red Deer River has been named after Johnstone, in recognition for his work in promoting trail development. Johnstone died a few years ago. ATVs, horses, hikers and bikers may soon share a new trail system running between Rocky Mountain House and Nordegg. Clearwater County council this week chose Rimbey-based Armstrong Consulting to look into various aspects of creating a multi-use trail on an abandoned railbed running through the region. The county hopes to create a trail that will accommodate all types of users, community and protective services manager Mike Haugen said on Friday. "There is a few of them around the province being looked at. One of the big thing with our trail, we want to be open to ATVs." Quads and bikes are being kept off a number of trails because of the environmental impact, said Haugen. Part of the study on the new trail will look at ways to limit that impact, he said. "We're looking to see how we can facilitate it in a more environmentally friendly and sustainable way," said Haugen. "One of the issues (the consultant) is going to be looking at, how do we get all of the users we want on this trail and make sure it's safe and enjoyable for everybody." Along with those issues, the consultant will also look at the possibility of building campgrounds along the trail to accommodate horses and quads. Neither are allowed in provincial campgrounds at this time, said Haugen. The consultant will meet soon with the county's steering committee and then work on the study can get started. The county hopes to see a report in late February or March. The hope is that construction could start in spring, but the county is not committing to any specific time lines at this time, said Haugen. Budgeted at $100,000, the cost of the study is being shared by the county and Alberta Tourism, Parks and Recreation. Two of Red Deer's most dedicated environmental stewards were honoured posthumously by city council on Monday. Michael O'Brien was a long-time Red Deer River Naturalist and founding member of the Ellis Bird Farm, who died in 1997. He will now be linked to a new natural area. Council approved naming a storm water management facility north of the Clearview subdivision, The Michael O'Brien Constructed Wetland. Bob Johnstone passionately supported trail development in the Red Deer region, worked on the city's Bicycle and Gaetz Avenue Master Plans, and was a member of Alberta TrailNet. He will now have a trail named after him. Part of the Waskasoo trail system that links the 55th Street pathway to the South Bank Trail is now called the Bob Johnstone Trail. People got their first look this week at detailed, long-term plans for trails, parks and other open spaces in Red Deer County. About 20 people came out to an open house on Tuesday at Red Deer County Centre to see maps of seven zones within the county as part of the Open Spaces Master Plan where future recreational projects have been proposed. Work on the master plan started in 2005 and the zones were first identified in 2007. The aim is to have a variety of open spaces throughout the county to take advantage of the natural beauty of different areas and connect them by trails where possible. "People were saying they wanted more access to the river. They wanted some trails between recreation destinations for people to go around some of the lakes," said planner Alex Taylor with Dillon Consulting. Biking and walking trails would be developed near communities so people would have easy access to trail systems. "They are fairly small-scale projects because the county wants to do it in pieces here and there," Taylor said. - The Bowden-Dickson Zone provides a range of open spaces including features such as the Little Red Deer River and Gleniffer Lake. The zone connects the C & E Zone with the Medicine River Zone. Maps for three trails already approved by the county were also on display. They include a 3.6 km trail to be built from Springbrook to Penhold, a 6.8 km trail between Spruce View and Dickson and a one km trail at the west end of Gleniffer Lake to provide public access to the Red Deer River. People will have another opportunity to view all the maps at an open house at the County Fair at Red Deer County Centre on Sept. 13. Zone maps are not available on the county's website, but people can go to Red Deer County Centre for information. The Open Spaces Master Plan will go to county council for approval before December. An abandoned rail line west of Rocky Mountain House could be transformed into a haven for hikers and cyclists lured by river-spanning bridges amid spectacular mountain backdrops. It's a vision that Clearwater County has been nurturing for years and has recently been given a boost after council agreed to seek provincial funding for a $100,000 design concept for a Nordegg to Rocky trail. While the potential of the trail has been recognized for many years, the project remains in its infancy, cautions Ron Leaf, assistant county manager. "This is really at the idea stage right now," he said. About five years ago, the county did some basic surveying work to see what shape the trail was in and how much work would be involved in making it safe for outdoors enthusiasts, which could also include horse and all-terrain vehicle riders. Estimates for getting the 120-km route into shape range from $1 million to $2 million. Among the challenges will be replacing decking on three rail trestles, which would likely prove among the highlights for trail users. "We did some preliminary engineering on those about five years ago," he said. "Structurally, they appear sound, but we're going to have to do some work there." There are also two dozen stream crossings to contend with, as well as sections of the old rail line where the ties have been left in place. When completed, it is hoped an attraction could be created along the lines of B.C. 's Kettle Valley Railroad, which is an abandoned railway bed that winds for 600 km through south central B.C. between Midway and Hope. Leaf said there is much the Rocky trail could offer. 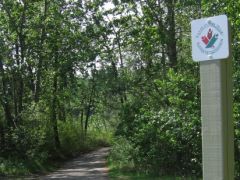 There are a number of small former mining communities along the route and it is hoped the trail could be connected with existing attractions such as Chambers Creek Park. Leaf said groups such as Alberta TrailNet could also be recruited to participate in turning the route into a destination for those seeking healthy living travel options. If the project goes ahead, it is expected the trail would be built in sections over several years, likely starting in Nordegg and working east. The abandoned rail line ends about 20 km west of Rocky and a route would need to be mapped out. Negotiations would also be necessary with forestry companies, whose timber rights cross the rail line.